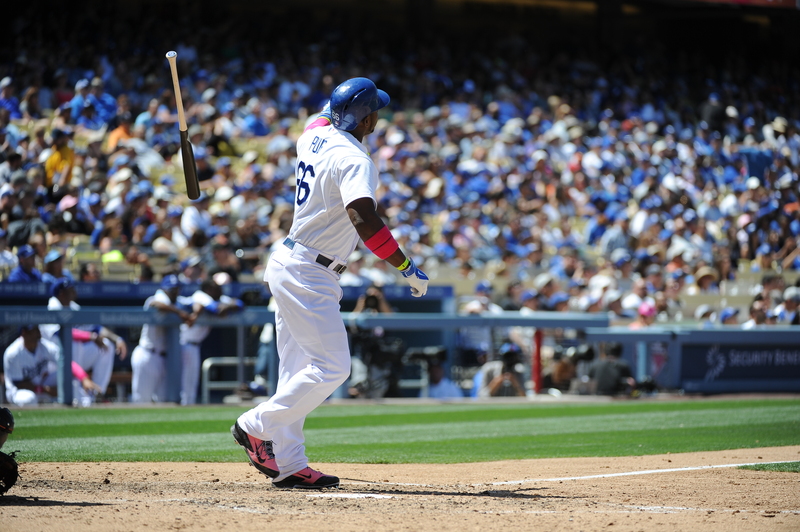 Was there a more entertaining Dodger than Yasiel Puig? There are many plots and subplots to today’s trade news, some with vital implications for the future of the team, that I will leave to others, because I find all I can think about right now is the Wild Horse’s final gallop in Los Angeles. 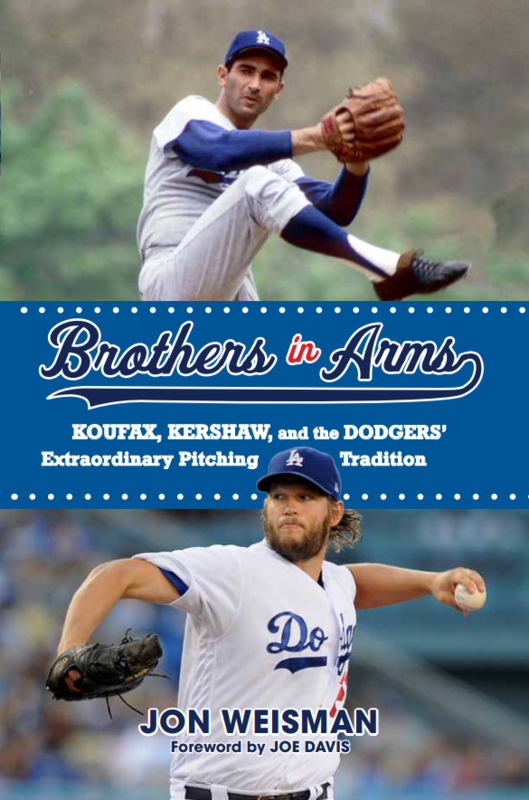 If you have any sense of Los Angeles Dodger history (and if you don’t, click here! ), you know about the iron man. Steve Garvey played in every game the Dodgers had from 1976 through 1982 — 1,083 in all, and except for eight pinch-hitting appearances, all at his favored position of first base. At his durability peak in 1976, Garvey played in 1,464 2/3 innings, or all but six innings the Dodgers played that year. 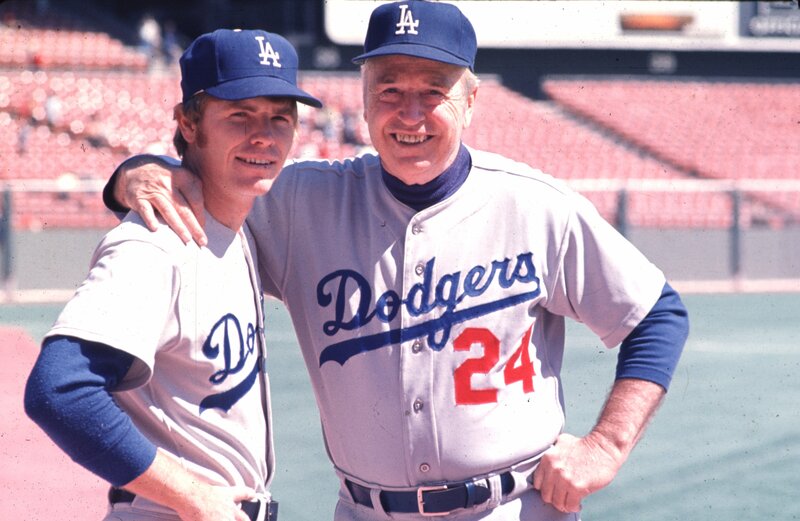 Surprisingly, that 1976 season didn’t make Garvey the Dodgers’ all-time single-season innings leader. In a largely forgotten but rather astonishing 1973 season, Bill Russell was on the field at shortstop for every single out the Dodgers made except for four of them. 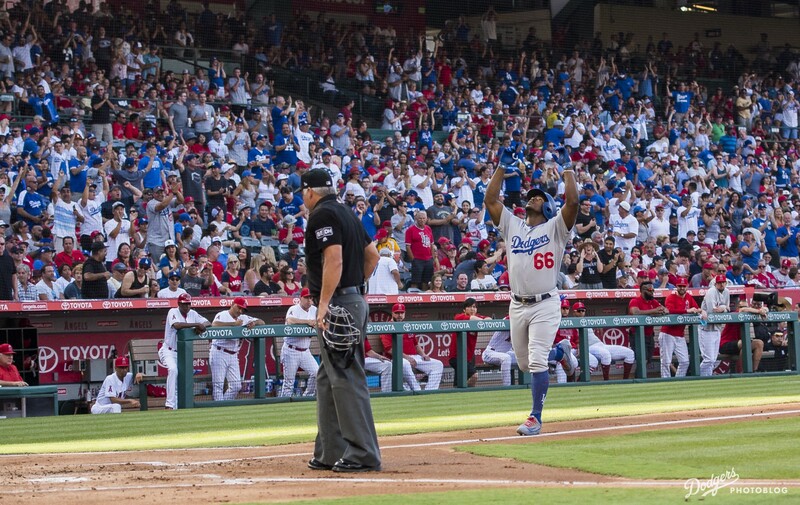 On April 7, in the Dodgers’ second game of the season, Russell gave way in the top of the ninth inning to pinch-hitter Von Joshua, who hit a game-tying RBI single. Davey Lopes, who scored the tying run as a pinch-runner, went to shortstop for the first time in his MLB career in the bottom of the ninth, which lasted only two batters before Jerry Morales hit a walkoff homer against Dodger reliever Jim Brewer. On July 21, Russell took a breather in the bottom of the eighth inning of an 8-1 loss at St. Louis, missing the Cardinals’ final three outs in what I expect was a steamy summer’s evening on the Busch Stadium astroturf. That was it. Russell, who racked up 163 hits but only had a .301 on-base percentage in 1973, played in 99.9 percent of the Dodgers’ innings at short that year. If those are the iron men, let me introduce you to (pause to Google most flexible metals in the world) the graphene men. This year, the Dodgers are heading for a couple of unprecedented fielding events that underscores the team’s unusual versatility. For the first time in a 162-game season, there might not be a single Dodger to play even 1,000 innings at a single position — remarkable considering that the team will play close to 1,500. And, their leader in innings at one position — also for the first time since at least 1962 — might be a catcher. It’s not as if the Dodgers must call up an outfielder if, as expected, Yasiel Puig goes on the disabled list with an oblique strain suffered Sunday. 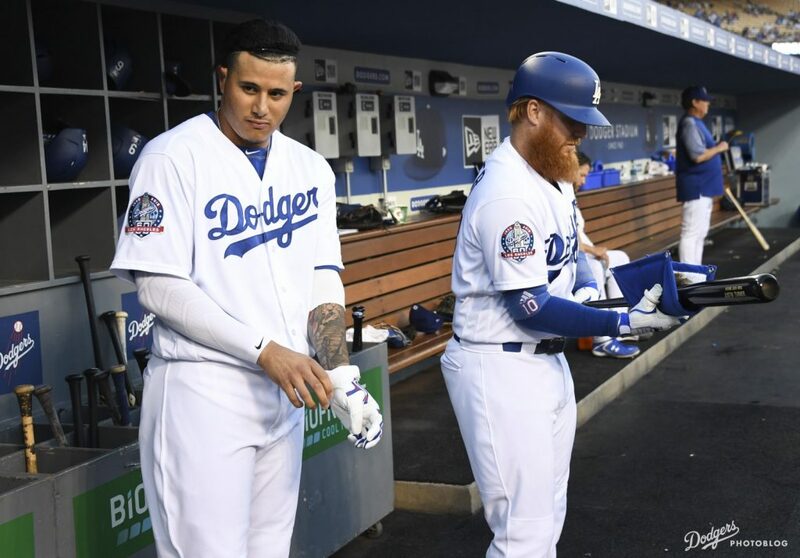 In addition to Matt Kemp and Joc Pederson, they have three infielders who play outfield in Chris Taylor, Kiké Hernandez and Cody Bellinger, and relocating Bellinger to center (with Kemp in right) would open up time for Max Muncy to play first base and give him a break from learning second base on the job. But moving an infielder to the outfield would also force more playing time at second base for the likes of struggling Logan Forsythe (1 for 27 with two walks and 11 strikeouts since June 22) and Chase Utley, whereas you could hardly ask for better outfield candidates for the Dodgers to import from Oklahoma City than Andrew Toles and Alex Verdugo. When you’re out of the blogging groove but the ideas keep coming, the easy thing to do is just dish them off on Twitter. But tweets are like shooting stars, and sometimes you want a constellation. 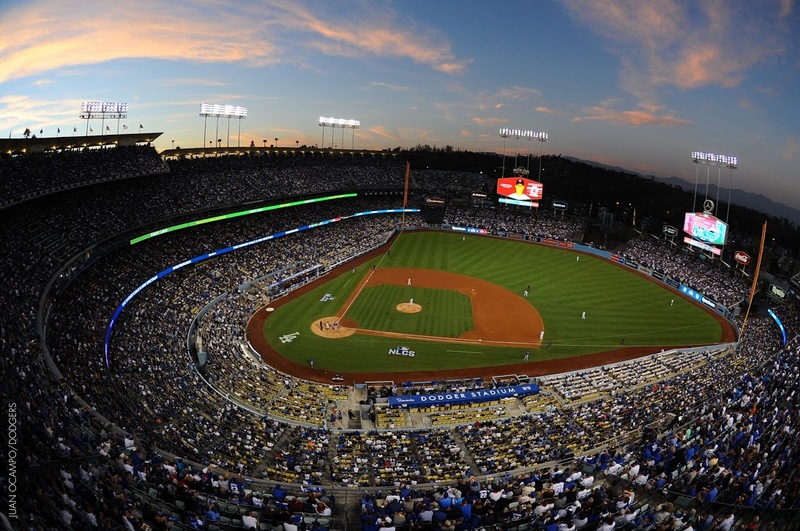 So here I am back at Dodger Thoughts to try to collect some thoughts. Also, I’m convinced that tons of people bypass the intro to a column and to get straight at the meat, so let’s get right to it. One other thread in the Andre Ethier legacy is that he is the all-time Los Angeles Dodger leader in times being hit by a pitch, with 58. But at the rate Justin Turner has been going, Ethier’s reign might not last the year. Last year, the Dodger third baseman set a single-season franchise record with 19 HBPs, breaking Alex Cora’s previous and literal mark of 18. (Cora also held the Los Angeles career mark before Ethier.) 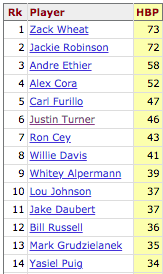 That gave Turner 46 plunkings as a Dodger, putting him within 12 of Ethier — and Turner has averaged 14 HBPs over the past three seasons. Pitchers paint on the edge of a cliff. They are artists, tending to a tiny canvas that hovers in mid-air, and they are adventurers who might fall at any moment. 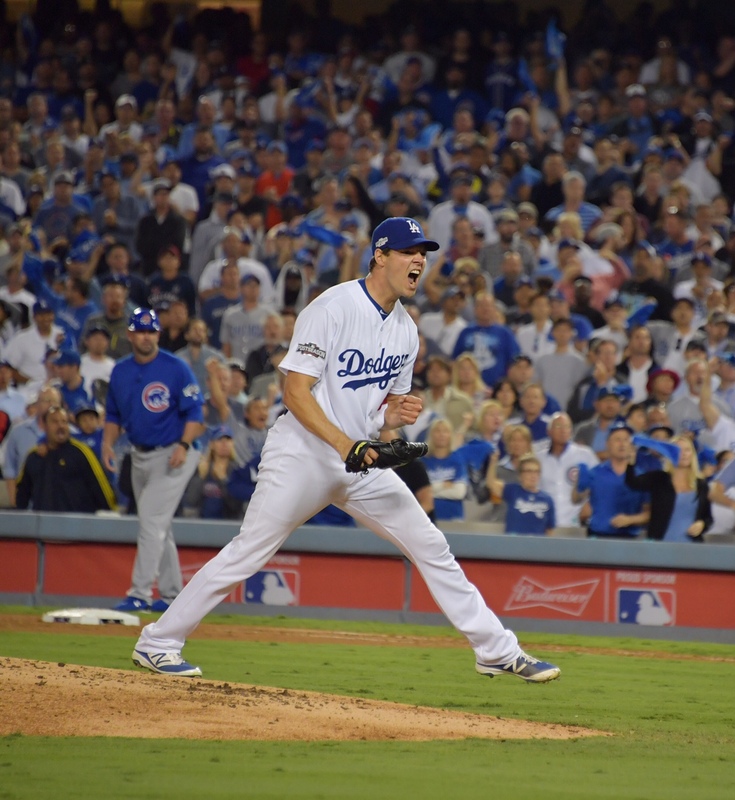 Rich Hill took a minor masterpiece into the sixth inning tonight at Dodger Stadium. After walking two of three batters with some tremulous brush work to start the top of the second, Hill was in his element. Twelve of the next 13 batters he faced became dots on his Seuratian landscape. In the top of the sixth, the ground beneath Hill’s easel began to quiver. With one out, Kris Bryant singled to left center, for the second hit off the Dodger left-hander. With two out, Anthony Rizzo took the first four pitches, and three fell outside the borders of the strike zone. On deck was Javy Baez, whose electric play helped the Cubs win Game 1 of the National League Championship Series and nearly Game 2 as well. Hill raised his arm and lofted the next pitch, a 74 mile-per-hour curveball that sidled through the California air with the arc of a rainbow, landing into the glove of Yasmani Grandal for strike two. Then, at 87 mph, Hill dropped down with a master’s flourish. Hill pumped his fist, shouted to the heavens and handed his work to the gallery, for 54,269 art-lovers at Dodger Stadium to marvel. The 36-year-old’s six innings of two-hit shutout ball, his finest performance since he threw seven perfect innings at Miami on September 10, were framed by Grandal, the catcher who also hit a two-run home run off Jake Arrieta in the Dodgers’ 6-0 victory. Taking a 2-1 lead in the NLCS, the Dodgers are as close to the World Series as they have been in 28 years. Hill struck out six, giving him 19 in 13 postseason innings (13.2 strikeouts per nine innings) with a 3.46 ERA. With Joe Blanton, Grant Dayton and Kenley Jansen finishing the game, the Dodgers have thrown consecutive postseason shutouts for the first time in franchise history. A number of Dodgers had personal connections with José Fernández, such as Austin Barnes, Chris Hatcher and Kiké Hernández, who all played in the Marlins organization with the All-Star right-hander. 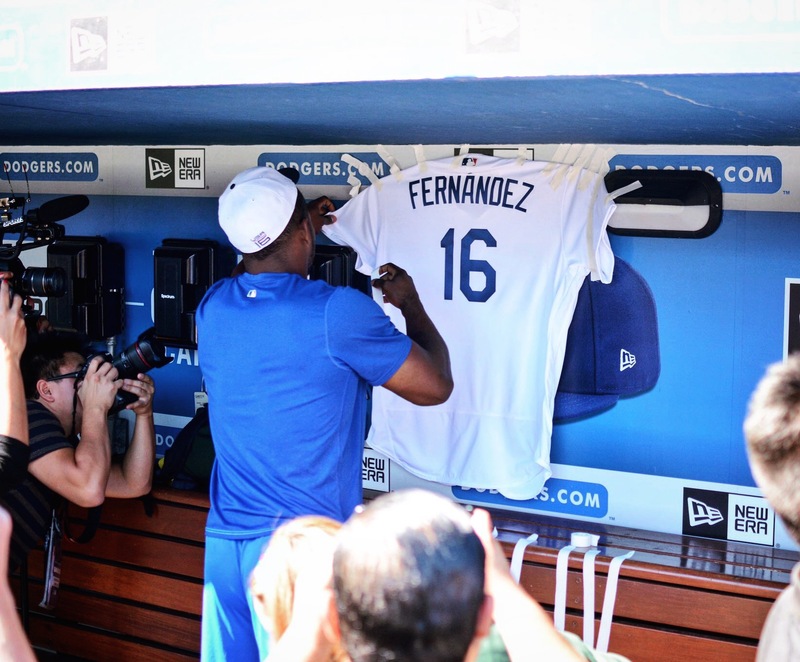 But perhaps no one in Los Angeles was closer to the Miami All-Star, who died overnight in a boating accident, than Yasiel Puig. As the catch was made, as the third out was recorded, as the crowd roared, as the legendary announcer uttered one more “¡Que viva Cuba!” at his final Dodgers-Giants game in Los Angeles, the outfielder’s teammates gathered in a handful near the third-base line, unwilling to wait for the prodigal son to return to the dugout. They needed to see him there, then, on the field, in the moment. 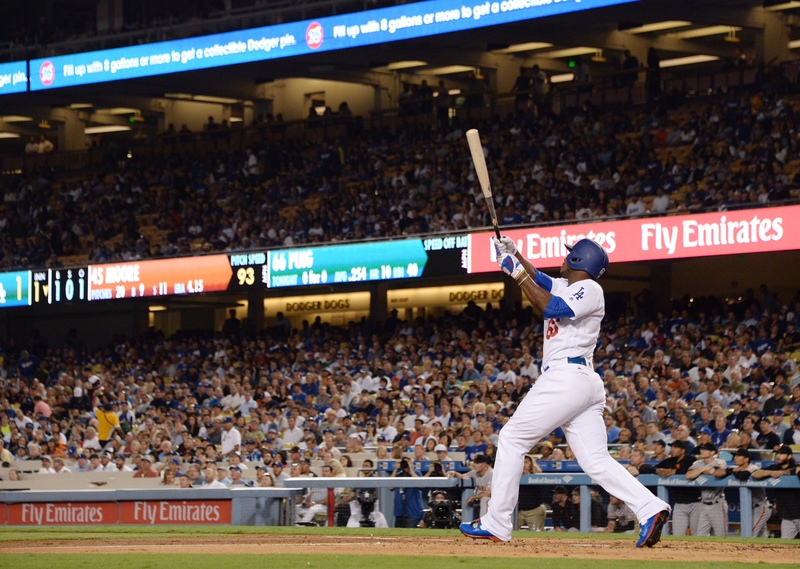 Yasiel Puig, baseball’s living, breathing roller coaster, had done the full loop. After the Giants’ starter told the Dodger outfielder not to look at him, the Giants’ relievers only made him want to look away. Trailing 1-0 in the ninth inning, the Dodgers rallied against the beleaguered San Francisco bullpen, parlaying three singles and a walkoff Adrian Gonzalez double into a 2-1 victory that put them a season-high six games up on the Giants with 12 to play. Magic number: seven. 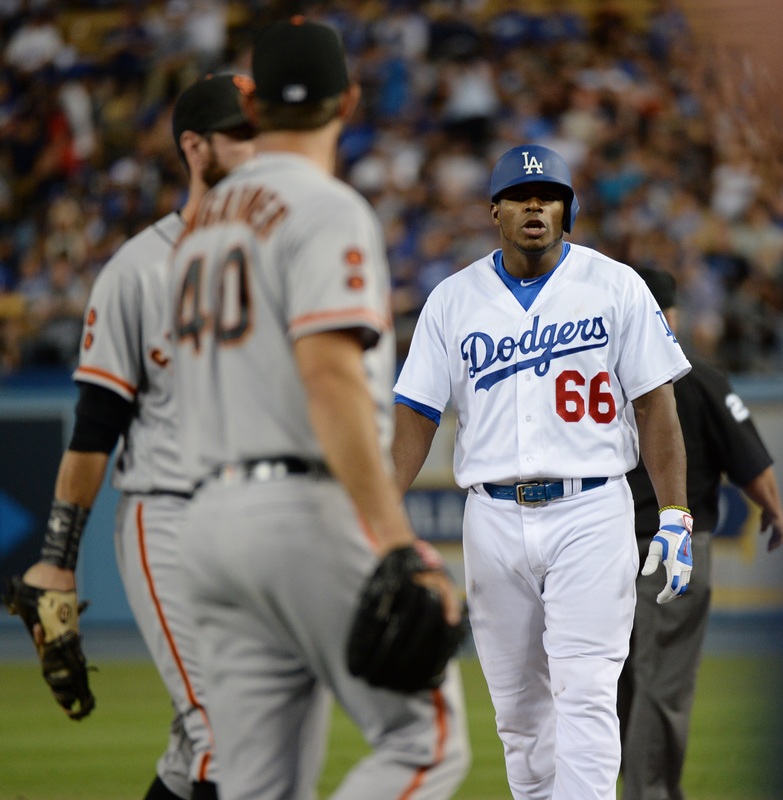 A seventh-inning brouhaha (minus the haha) between Madison Bumgarner and Yasiel Puig on the edge of the first-base line added another layer of intensity to the Dodger-Giant rivalry, a prelude to a victory almost as cathartic as it was important. San Francisco had one base hit that went past the infield tonight in Los Angeles, and it had nothing to do with the outcome. Instead, what happened within the infield made the difference for 8 1/2 innings. Taking the equivalent of a Big Wheel ride around the bases, the Giants motored their only run on an infield single, stolen base, error and wild pitch. With two out, Eduardo Nunez hit the equivalent of an errant miniature-golf tee shot to Kershaw’s left. 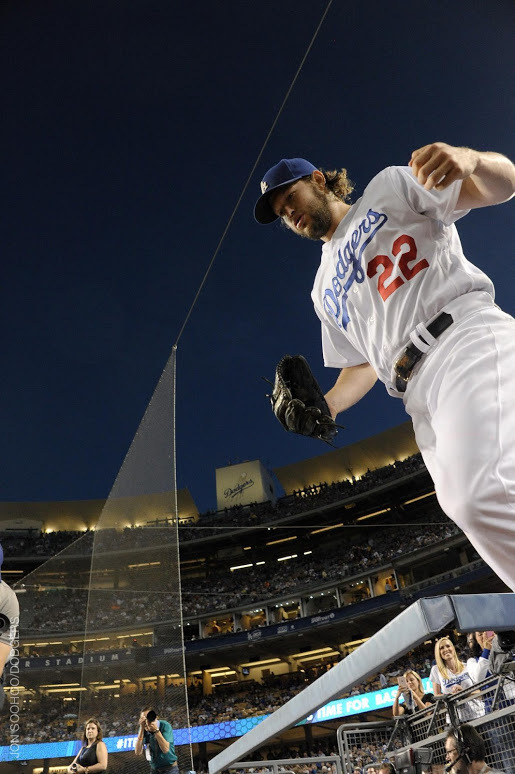 Three starts into his return from a disk herniation, Kershaw lunged but couldn’t reach it. Chase Utley charged to glove it, but couldn’t get a desperate throw to first in time, despite Nunez’s head-first, dirt-burst slide. With two out and two strikes on Angel Pagan, after nearly being picked off by Kershaw, Nunez took off for second. Yasmani Grandal’s throw sliced like a screwball, out of Utley’s reach at second, allowing Nunez to slide in safely and then scamper to third. One foul ball later, Kershaw bounced a slider in the dirt in front of home plate and through Grandal, and for the low, low investment of that 60-foot single, Nunez had earned 360 feet of bases and the shutout-breaking run. That unearned run was the only mole on the Kershaw visage in his six innings. With the Dodgers trailing 1-0, he left for a pinch-hitter, having allowed three hits and a walk (his 10th of the season, compared with seven strikeouts on the night and 162 strikeouts in 2016). But the Dodgers couldn’t make half the dent in Bumgarner that he made in them. Only Yasiel Puig had a hit against the Giants’ lefty, though Grandal and pinch-hitter Rob Segedin were hit by pitches. “Don’t look at me,” Bumgarner said while looking directly at Puig, winning the approval of the Irony Committee. Benches cleared, but little came of it. Except Bumgarner didn’t throw another pitch. Though he has crossed 100 pitches in his past four starts, Bruce Bochy decided that 97 of them to 24 batters with 10 strikeouts was enough for Bumgarner tonight, using a pinch-hitter in the top of the eighth and turning the game over to what has become a notorious bullpen. With two out in the bottom of the eighth, pinch-hitter Carlos Ruiz got the Dodgers’ second hit, but nothing came of it after Derek Law retired Howie Kendrick on a fly to right. In the bottom of the ninth, magic pixie dream hitter Andrew Toles came off the bench and singled sharply to right. Javier Lopez replaced Law. Corey Seager, one strike away from his fourth whiff of the game, drilled a grounder past a diving Joe Panik for another single, pushing Toles within 90 feet of tying the game. Hunter Strickland replaced Lopez. 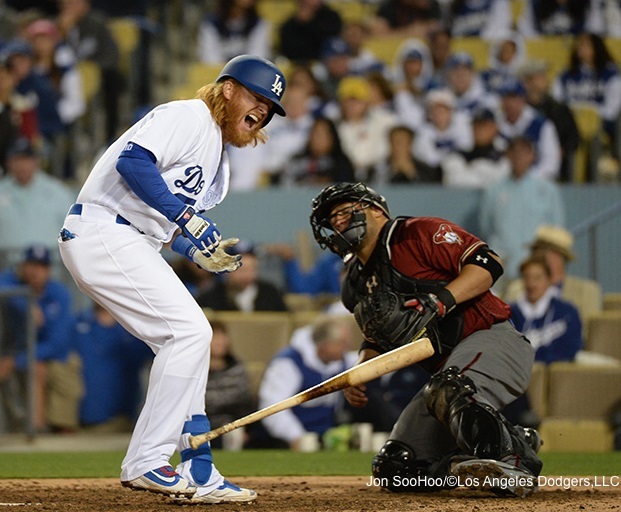 Justin Turner, also with two strikes against him, shot a third straight Dodger single to right, scoring Toles. Gonzalez came up, and he rocked a ball to the wall in right center. Tagging up for a potential catch, Seager shifted into forward gear when right fielder Hunter Pence came up empty, and roared around the bases for the winning run and the biggest celebration at Dodger Stadium this year. Dodgers at Marlins, 10:10 a.m. I guess my wife and I picked the wrong day to take the family to Disneyland. Exactly 51 years and one day after Sandy Koufax threw the last perfect game by a Dodger pitcher, Rich Hill nearly did the same (in a 5-0 Dodger victory). And in the process, he became the first Dodger pitcher since Hiroki Kuroda in 2008 to throw seven perfect innings — and the first ever to do so without facing another batter. The Dodgers are on a little streak of happy starting pitching, at least by 2016 standards. For the 14th time in their past 15 games, their opening hurler reached the five-inning checkpoint — not Koufaxian by any means, but the majority of the game nonetheless. This is happening while the franchise currently employs 14 relievers — no, that’s no lie — on its active roster. So with an off day beckoning in a close game, Dave Roberts played himself some cards. The Dodgers used six relievers to handle the sixth through eighth innings, before Kenley Jansen closed the ninth for a 3-1 victory and series sweep over Arizona. Los Angeles fared far better than San Francisco, which employed eight relievers tonight at Colorado and still blew a 5-3 lead in the ninth, to fall a season-high five games behind the Dodgers in the National League West. Following fellow freshmen Jose De Leon, Kenta Maeda and Ross Stripling, right-hander Brock Stewart gave the Dodgers four consecutive victories by rookie starting pitchers, unprecedented in Dodger history.